Constantly finding reasons not to exercise is not going to keep you in the pink of health always. Apart from weight gain, lack of physical activity can lead many other health problems like diabetes, bone thinning, high blood pressure, etc. You might have heard this before - exercise is as important as brushing your teeth in the morning. So get up and get moving! 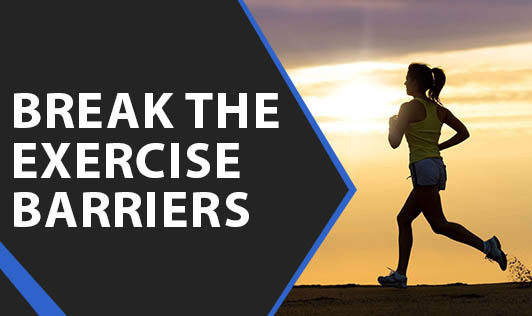 Here are a few tips to break some of the most common exercise barriers. If you find it boring to exercise alone, find a friend, neighbour or a family member to exercise with you. If you don't like to do the same exercise 5 days of the week, include variety. Go for walks on 2 days, visit the gym on 3 days. Or you can include yoga, tai-chi or dancing once a week. If you don't have the time for an hour's exercise in the morning, do it in the evening. If you cannot keep aside one hour at a stretch, split into 2 half hours. Include shorter activities in between like stair climbing, spot jogging, walking to your colleague's cabin instead of pinging, grocery shopping in the neighbourhood, etc. If you don't like to be seen in track pants or gym clothes, exercise at home. If it's raining and you don't feel like leaving the house, follow an exercise program on television and work-out along with the participants. If you're worried about getting injured, begin slowly and gradually increase speed and intensity. If you feel discouraged that you are not losing weight or inches, wait for a few weeks to see results. Don't give up on the exercise. Remember, there's no excuse to deter you from being active. The more physically active you are, the healthier you will be in the long run.